First published in French in 1678, The Princess of Cleves (or La Princesse de Clèves to give it its French title) is considered to be one of the first psychological novels. The story is set in the previous century (between 1558 and 1559), which also makes it an early example of the historical fiction novel. Newly arrived at the court of Henri II, the beautiful Mademoiselle de Chartres catches the eye of the Prince of Cleves and they are soon married. The new Princess of Cleves does not love her husband, but she likes and respects him and for a while it seems that might be enough…until she meets and falls in love with the Duc de Nemours. The rest of the book explores the Princess’s conflicting emotions, as she becomes torn between her passionate love for the Duc and her desire to stick to her morals and do what she believes is right. Eventually the Princess faces an important decision, but the choice she makes is maybe not what you would expect and it’s left to the reader to make up their own mind whether they agree with her actions or not. This book was of particular interest to me because earlier this year I read Queens’ Play by Dorothy Dunnett, which is set at the French court in the middle of the 16th century. The Princess of Cleves is set at the same court during the same period and so it was filled with names I recognised. The title character and her mother are fictional but the others are real historical figures: Henri II and his wife Catherine de’ Medici, Diane de Poitiers (the Duchess de Valentinois), the Constable de Montmorency, the Mareschal de St. Andre, the Prince of Conde, the Vidame of Chartres, the Duke de Guise and his brothers, as well as the Dauphin and his wife, Mary Queen of Scots. I think the fact that I was already familiar with these characters made the opening pages of this book slightly less overwhelming than they might otherwise have been! And luckily, only a few of the people mentioned play an important part in the story, so it’s not necessary to keep track of all of them. If you can get past the first section, which is little more than a long list of names and descriptions of the relationships between the various courtiers, the story does start to pick up. It all appears to be very accurate historically, although not much attention is given to the important historical events of the period – this is a character driven story with the focus on the actions of the Princess, her husband and the Duc de Nemours. The court of France at that time was known for being frivolous, decadent and rife with romantic intrigue and gossip, and the author manages to capture these aspects of court life. However, having read about the background to the novel, it seems Madame de Lafayette was also commenting on the behaviour and structure of the court of her own time, Louis XIV, which I know less about so am not sure how similar or different the two courts were. The Princess of Cleves is not a book I would recommend if you’re looking for an entertaining read with an exciting plot, but if you enjoy French literature and history or if you’re interested in the development of the early novel then I think it’s definitely worth reading. It’s a short novel and doesn’t take too long to read, though it does require some concentration, especially at the beginning. I found the writing very dry, though maybe that’s my own fault for reading the free version from Project Gutenberg rather than searching for a better translation. As I’m not able to read it in its original French, which would obviously be the best option, I’d appreciate any opinions as to which translation I should try if I decide to re-read the book at some point in the future. Hopefully there is a better translation out there than the Gutenberg version (although I haven’t tried it myself, I have experience with translations of other books in the public domain that aren’t necessarily the most easy to read, or the most lively). I’d love to know if you find out..
I’ve always been curious about this title, and I’m happy to hear it isn’t a long read. I can imagine that the first part as you describe it would require a lot of attention! This is definitely still on my TBR list, but I might follow your advice and research the available translations a little before reading it. The public domain version is readable but feels very stilted in places and I’m sure a more modern translation would be more enjoyable to read. And no, it’s not a long book – most paperback editions seem to have less than 200 pages. As soon as I saw your comment about the setting, 1558-1559, I thought about Lymond! I wonder if Dorothy Dunnett read it. It does sound interesting – but I think I’ll avoid the e-version. I’m tempted by the OWC you show – what a lovely cover. I wouldn’t be surprised at all if she had read it. It’s almost exactly the same time period as Checkmate, though I was reminded more of Queens’ Play due to all the descriptions of the court intrigues and romances. How interesting that this is one of the first historical novels! I always see it listed on lists of literature written by women, but have not had the courage to try it. I might be willing, too, if we can find a good translator. I’ve done some research and it seems that a lot of people recommend Nancy Mitford’s translation. It might be worth looking for that one. 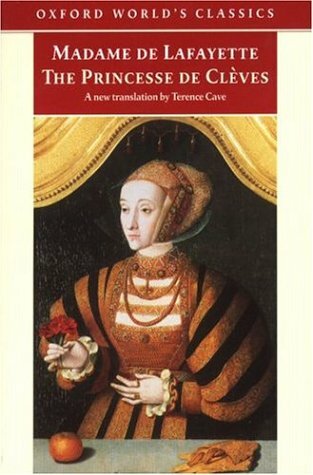 I’m not sure why they used a picture of Anne as she doesn’t have any connection with this book other than the word Cleves! I’ve been tempted by this one (especially because of the DD connection), but you really need to be in a 17th century literature frame of mind. I think I’ll try it at some point in audiobook version. Might smooth the expected dryness. Yes, it’s definitely the type of book you have to be in the right mood for! I think you would find it interesting though, because of the connection with Queens’ Play and Checkmate.